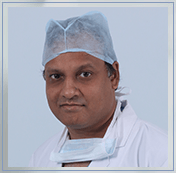 Dr. Raghvendra Jaiswal has a rich experience in training house surgeons. He worked as the Registrar of the Department of Orthopedic & Trauma Surgery at Dr. Ram Manohar Lohia Hospital. He is trained in Computer Assisted Surgery(CAS). M.Ch (Ortho) – Ninewells Hospital and Medical School, University of Dundee, Scotland –U.K -2007. M.S (Orthopedics & Trauma) – KMC (Manipal Academy of Higher Education)-Karnataka – India – 2004. B.B.S – KMC (Manipal Academy of Higher Education) – Karnataka – India – 2000. A wide range of Orthopedic procedures covering various subspecialties including Arthroscopy, Spine surgery and Pediatric Orthopedic. Workshop on “UNICOMPARTMENTAL KNEE REPLACEMENT ARTHROPLASTY” at Cuschieri Skills Center, Nine wells Hospital, Dundee- Scotland, U.K – MAY 2008. Workshop on “BIRMINGHAM HIP RESURFACING” at Cuschieri Skills Center, Nine Wells Hospital, Dundee – Scotland, U.K – April 2008. Workshop on “ TOTAL SHOULDER AND TOTAL ELBOW REPLACEMENT ARTHROPLASTY” at Cuschieri Skills Center, Nine Wells Hospital, Dundee- Scotland, U.K – March 2008.